Handing the sequel over to John Woo was a stroke of genius, because this isn't just Mission: Impossible II (or M:I-2, as the posters render it) ... no, with all the mug-swapping, it could just as easily be titled Face/Off II. And it's so much like a 007 film that we should get a petition going for Woo to direct James Bond 20! Because it's all here: thunderous action, breathtaking stunts, visceral romance and preposterous plotting. Glorious. The story involves a genetically engineered virus stolen by its inventor (Sherbedgia, underused) and then intercepted by rogue Impossible Mission Force agent (Scott). 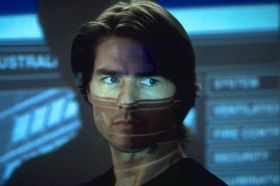 So the IMF boss (Hopkins, uncredited) calls in ace agent Hunt, Ethan Hunt (Cruise), to recruit an ace Euro-thief (Newton) and with the help of his ace techie partner (Rhames) get the virus back. And the antidote as well, of course. Blah blah blah. Get on with it, Mr Woo. And that he does. The continuous string of set pieces are positively jaw-dropping with their outrageous physicality--bullets, glass, people, cars, motorbikes, you name it flying everywhere, all underscored by a sense of wit and exuberance that keeps us gasping and chuckling. This is an absolutely spectacular action film, almost criminally entertaining and anchored by solid performances (Newton and Scott are especially good), powerhouse production values, fabulous Sydney scenery and even a slushy romantic triangle. What Towne is doing writing this drivel is anyone's guess (although he did cowrite M:I-1), but this will assure Woo's status as the king of the action pic. Capraesque. Hitchcockian. Add Wootastic to the Lexicon. Wendy W, Miami: "Whoopee! Go see this one. It's full of the good guy, really bad guys and the beautiful suffering woman stuff. The handsome hero steps out of fire, rides a motorcycle with two feet on the ground on one side of the bike, he climbs fabulous geological rock cliffs defying death, lets loose of lots of bullets, and car crashes pepper nearly every scene. It's also very funny in all its so-perfect camera shots." Laurie T, Minneapolis: "To be honest, I did not like the first Mission Impossible - the plot was too complicated and twisted. But seeing the previews of this one, with an interview of Cruise about how he does all his own stunts, and that rock climbing scene at the beginning ... well, I had to see this on my own. This movie is more like the TV series, with more of the face-peeling and the stunts are awesome. Tom looks quite the hunk with the stunts he does, and there is definitely more action. The plot was sluggish in the beginning; as a lab tech, I was even having some difficulty understanding the whole idea of antigen/antibody thing - and I do that for a living! But once you get past the 'explanation' of things, the action begins. I don't think this was a great movie, but it was fun and had lots of action. It was fun to go see, and I think it was better than the first - the plot was a bit easier to follow, and the stunt scenes are breathtaking." Converting old TV shows into major motion pictures is all the rage right now ... in fact, I've lost track of how may have come out recently or are due in the next year. Whatever, the current blockbuster is Mission: Impossible, with a major pedigree: starring and produced by Cruise, directed by DePalma and with a script by Koepp and Towne. Naturally, expectations were high. Fortunately, the film is thunderously enjoyable. As it races through its complicated plot, you barely have time to catch the details before it moves on to its next big set piece--a tricky espionage mission in Prague, an elaborate break-in at CIA HQ, a helicopter-train chase through the Chunnel. With all this action and technical wizardry, you don't really have time to notice that the plot makes no sense at all. And with the clues the script gives you, you couldn't make sense of it even if you had a pause button. But then, that's hardly the point, is it? We only care that there are good guys (Cruise, in rough-and-ready heroic mode) and bad guys (ah, here it gets a bit hard to pin down). Scott-Thomas and Beart provide good atmosphere but little else as Cruise's fellow IMF agents. Czerny is quite creepy as the CIA chief. Rhames and Reno get decent characters to chew on, always keeping us wondering. Voight gives a revisionist spin on Jim Phelps (played by Peter Graves on TV)--he's a shadow of his focussed, cool-headed self. This will disturb fans of the series ... but at least Voight is a good enough actor to make the character his own. And Redgrave has a ball as a gleefully bad arms dealer--she's absolutely wonderful! But we're not here to analyse character or plot. We're here for the adventure and intrigue, and DePalma certainly gives us that. His trademark sure-handed direction never lets us down, and his Hitchcockian colour scheme adds considerably to the tension and atmosphere. Danny Elfman's music is terrific, too ... and the adrenaline really gets going when the familiar strains of Lalo Schifrin's Mission: Impossible theme thunder into the background, signalling a shift into high gear. Fortunately, that happens quite a lot!